Are you familiar with the Fresh Air Fund? It is an independent, not-for-profit agency that has provided free summer vacations to more than 1.7 million New York City children from low-income communities since 1877. In 2008, close to 5,000 children visited volunteer host families in suburbs and small town communities across 13 states from Virginia to Maine and Canada. 3,000 children also attended five Fresh Air camps on a 2,300-acre site in Fishkill, New York. The Fund’s year-round camping program serves an additional 2,000 young people each year. The Fresh Air Fund received a tremendous offer by some very generous donors. Right now any gift you make to The Fresh Air Fund will be matched dollar for dollar by a group of generous donors! If you can give $25 that means $50 for inner-city children. $50 becomes $100! But you must make your donation June 30thto take advantage of this wonderful opportunity! The Fund is still in need of hosts for this summer. Host families open their hearts and home to a child to give a fresh air experience that these children never forget. The Wilding Foundation awards scholarships to those of exceptional ability and prowess in sports, arts, humanities, health, medicine and environmental activities. The Foundation will support those who may not otherwise have the financial means and/or knowledge at hand to further their potential. The charities aims are diverse with the inclusion of several primary scholarships. The first scholarship is in honor of one of the world’s greatest tennis players ,the Anthony Wilding Scholarship for prowess in sports. Anthony Wilding is a legendary tennis player who, amongst other things won Wimbledon a total of ten times prior to World War 1. He garnered the record for most Wimbledon singles titles in a row for over fifty years. This record was finally broken at Monte Carlo by Rafael Nadel in 2008. Rafael Nadel finally broke his long-standing record at Monte Carlo in 2008. Wilding’s doubles partner, in Davis Cup and Wimbledon was the great Aussie tennis player Norman Brookes. Wilding was the first man to take a motorcycle solo through Europe, his preferred method of travel between tournaments. Anthony tragically died in Flanders in 1915 at the age of 32. Along with the Anthony Wilding scholarship are awards in environmental, arts and humanitarian fields.The charity accepts contributions from donors worldwide. The Board of Directors hopes to see the charity grow steadily over the next few years. The Wilding Foundation is a proponent of Web 2.0, the social media platform and is pleased to announce that even Twitter users can now donate through their Twitter accounts. The Twitter username for the charity is “wildingcharity”. Anna Wilding, a supporter of humanitarian and environmental issues as well as a gifted filmmaker, has personally experienced what it is like to miss out – of not being able to pursue a chosen direction due to financial factors. Ms Wilding, tipped to go to Wimbledon and join the professional circuit herself as a youngster could not afford the required training overseas.She hopes that this charity will help bridge a gap for those impoverished who display talent and cannot afford the training, travel, study or equipment. Please visit the website at http://www.wildingfoundation.com/ to actively participate. 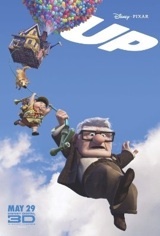 From Disney•Pixar comes “Up,” a comedy adventure about 78-year-old balloon salesman Carl Fredricksen, who finally fulfills his lifelong dream of a great adventure when he ties thousands of balloons to his house and flies away to the wilds of South America. But he discovers all too late that his biggest nightmare has stowed away on the trip: an overly optimistic 8-year-old Wilderness Explorer named Russell. From the Academy Award®-nominated director Pete Docter (“Monsters, Inc.”), Disney•Pixar’s “Up” invites you on a hilarious journey into a lost world, with the least likely duo on Earth. “Up” will be presented in Disney Digital 3-D™ in select theaters. Starring the voice talent of Christopher Plummer as Charles Muntz, Edward Asneras Carl Fredricksen, Jordan Nagal as Russel, Bob Peterson as Dug, and more. They brought us The Simpsons, Family Guy, and King of the Hill – and now they’re looking for the next great holiday TV special. And they’ve asked us to help find it. Create a 2 to 4 minute animated short about a well-known holiday – Christmas, Thanksgiving, valentine’s day, Halloween, anything celebrated in the U.S. Make it funny, make it edgy, make it uniquely fox. Submissions will be accepted from May 27, 2009 through August 31, 2009 with five finalists receiving $5k each, and the grand prize winner receiving an additional $10k plus a fox development deal with a $25k fund. 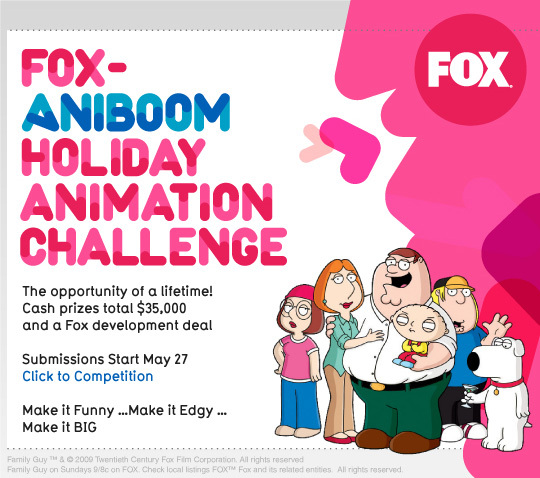 To learn more about how Aniboom can get you an opportunity to a development deal based on your short on FOX, visit the competition site. June is Internet Safety Month. The AAP offers a microsite to help parents with many aspects of keeping their kids safer online at http://safetynet.aap.org/ New tips on social media and “sexting” will be available in late May for the campaign. Thousands of children are treated for lawnmower injuries each year. 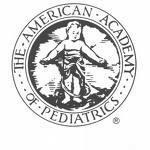 The AAP is partnering with the American Society for Reconstructive Microsurgery, the American Society of Plastic Surgeons, the American Academy of Orthopaedic Surgeons and the American Society of Maxillofacial Surgeons for their annual lawnmower safety campaign. Check back at www.aap.org for more information and tips during the last week of May. As in past years, every day is full of the thrill of filmmaking with special mentors challenging each camper daily to push their limits, and think ‘outside of the box.’ The FiF Camp is designed for creative minds ages 8-18. Every day begins at 9:00 AM and ends at 4:00 PM. All equipment, snacks, beverages and lunches are included in the price of the FiF Camp experience. Daily, a professional from some aspect of the film industry visits the FiF Camp to conduct a hands-on workshop in such areas as camera angles, stage combat, stunts, theatrical make-up, voice-over, scriptwriting, directing, producing, acting and many other topics. For more advanced filmmakers, the best week to attend the FiF Camp is July 20-24. During this week, the equipment and editing software are more sophisticated, the scripts are more complex, and the atmosphere is much more competitive. Unlike other filmmaking camps, the Freshi Film Camp has always been a totally immersive experience, 100% produced by the young filmmakers themselves. Although mentors are present to guide each of the participants, the campers handle all of the filmmaking experience themselves from creating a script to shooting the story, editing and, finally, scoring their films. The finished films are authentic to the creators and 100% original. This FiF Camp allows kids to find their own voice and tell their own stories- they are not the actors in someone else’s film, they are the filmmakers! The last day of the FiF Camp each producing group completes a Copyright Form to be submitted to the US Library of Congress to protect their authentic creations. The campers are organized into small production units on the first day of camp, and each production unit works to create their script, and then storyboard the script on the first day. The second day is the location scouting day with considerations of casting, costuming, make-up, props and sets. The film is shot on the third day and the editing is done on the fourth day. The final day of camp is scoring, titling and editing out-takes in preparation of the “Family and Friends Film Showcase” held the last hour of the FiF Camp on the last day. The completed films will be posted on the www.freshiflix.com website and shared with other young filmmakers worldwide. There are filmmakers aged 8-18 worldwide, and Freshi brings them together through the sharing of their creations and the possibility of future collaborations. The FiF Camp is $525 for the week but Freshi, in an attempt to help with the recession, is offering a 5% discount if space is reserved by June 5, 2009. There are even more discounts available for multiple family members attending the FiF Camp and for those young filmmakers attending all three camps. As an added bonus, all of the completed films from all three camps will be entered into the Freshi Film Festival for FREE. The FiF Camp is sponsored by the non-profit International Family Film Festival (IFFF) www.iffilmfest.org. The International Family Film Festival (IFFF) has a long association with producing the Freshi Film Camp and the Freshi Film Festival and working with young filmmakers for the last fifteen years, and making these events premiere summer destinations for creative youth. Summer is the time to set young imaginations free and there is no better place to do that than with the Freshi Film Camp! You are currently browsing the Granny Ranny's Coming Attractions weblog archives for May, 2009.